The term bronchial adenoma describes a diverse group of tumors arising from mucous glands and ducts of the trachea (windpipe) or bronchi (large airways of the lung). other mixed seromucinous tumors arising from mucous glands and ducts of the windpipe and large airways. These tumors are of widely variable malignant (cancerous) potential, although most of them are low-grade malignancies, growing and spreading much more slowly than true lung cancer. Only mucous gland adenomas are truly benign (noncancerous), lacking even the potential to turn malignant. The cause of bronchial adenoma is not known. Bronchial adenoma may remain undiagnosed for years because of the small size of the tumor and the slow growth pattern. This condition masquerades as bronchial asthma, chronic bronchitis, or bronchiectasis (localized irreversible expansion of part of the bronchial tree resulting in airflow obstruction and impaired clearance of secretions). Dyspnea (difficulty breathing) is caused by partial obstruction of the windpipe or large bronchi. Stridor (abnormal sound produced by turbulent flow of air through a narrowed part of the larger airways) can be present when the adenoma is in the windpipe or large bronchi. Wheezing (high-pitched whistling sound produced by the flow of air through narrowed smaller airways) is heard if the obstructed air passages are further out in the large bronchi. Cough, fever, and sputum production result from complete obstruction of the bronchi, leading to collapse, infection, and destruction of the lung tissue on the other side of the obstruction. Coughing up blood results from ulceration of the lining of the airway overlying the tumor and is fairly common in bronchial adenoma. Coughing up blood is a danger sign and nearly always indicative of a serious disease, whether bronchial adenoma or another lung condition. Persons with peripheral lesions are more commonly asymptomatic (that is, they do not have any symptoms). 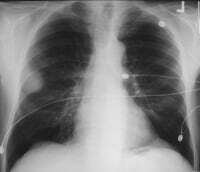 The peripheral lesions most often appear as solitary pulmonary nodules on chest X-ray films. Because these individuals are asymptomatic, the findings are typically found on chest X-ray films taken for other reasons. Although bronchial adenoma may remain undiagnosed for years because of the small tumor size and the slow growth pattern, people should be aware of its symptoms, particularly breathing difficulties and obstruction. Because coughing up blood is a danger sign and nearly always indicative of a serious disease, immediate medical attention is warranted in these cases. Chest X-ray films may demonstrate a nodule (less than 3 cm in diameter) or a larger mass of tumor. Oblique-view chest X-ray films may improve the ability to detect central lesions on chest X-ray films. Computed tomography (CT) scan of the chest allows a better assessment of the tumor. The doctor can tell how big the tumor is, exactly where it is located in the lung, and whether it looks like it is spreading to the lymph nodes. Magnetic resonance imaging (MRI) is generally used when CT scan findings are unclear. None of the above techniques accurately differentiate bronchial adenoma from other neoplasms (growths). Octreotide nuclear scan is a test used to detect carcinoid tumors and to determine sites to which they have spread. Bronchoscopy: This procedure is used to visualize the inside of the trachea (windpipe) and large airways in the lung for abnormal growths. After giving the person a sedative, the doctor numbs the throat and windpipe with local anesthesia. A bronchoscope (a thin, flexible, lighted tube with a tiny camera at the end) is inserted through the mouth or nose and then down the windpipe. From there, the bronchoscope can be used to look at the airways (bronchi) of the lungs. During bronchoscopy, the doctor may perform a biopsy (a sample of cells removed for examination under a microscope) on the tumor. Transbronchoscopic fine-needle aspiration: If the lesion is not easily accessible on the airway wall or is less than 2 cm in diameter, a fine-needle aspiration biopsy may be performed as a part of the bronchoscopic examination. CT-guided fine-needle aspiration: If a peripheral nodule is present, a needle may be inserted through the chest wall, between the ribs, and placed in the nodule. This biopsy specimen can be examined under the microscope to determine if the nodule is benign (noncancerous) or malignant. If these tests are nondiagnostic and if malignancy is likely, a thoracoscopic procedure or an open thoracotomy (incision through the chest wall) may be performed. If a person has been diagnosed with bronchial adenoma, the tumor is removed through bronchoscopic surgery; open lung surgery; or video-assisted thoracic surgery (VATS), a form of minimally invasive surgery. Bronchoscopic surgery may be performed if the tumor is small and limited to the airways. In this surgery, the tumor may not be completely removed. Also, the chances of profuse bleeding are higher. Therefore, bronchoscopic surgery for tumor removal is only recommended in people who cannot undergo open lung surgery or VATS because of other health conditions. The tumor can also be ablated through the bronchoscope using a laser. However, this method is not recommended as a primary mode of tumor removal and is usually used only for recurrent tumors. Following surgical resection (removal), the overall 5-year survival rate for people with bronchial adenoma is 96%. Long-term follow-up studies in most series report little evidence of local recurrence or distant metastases following surgical removal of bronchial adenoma. However, a few reports exist of local recurrence or distant metastases following adequate resection. Overall, the long-term prognosis for people with bronchial adenoma is excellent; therefore, limited resection should be used whenever possible. Bronchial adenoma. Large well-circumscribed mass in the periphery of the right upper lobe later was determined to be a neurilemoma. Click to view larger image. "Bronchial neuroendocrine (carcinoid) tumors: Treatment and prognosis"
What were the first symptoms of bronchial adenoma you experienced? What treatment did you receive for bronchial adenoma?